To properly choose your shade sail, you must first look at its shape (triangular or not) and its material (will it be waterproof or not). The aesthetic choices, related to the color for example, will intervene only after. What are the different forms of shade sails? At Espace Umbrage, we offer triangular, square, rectangular or trapezoidal shading sails. Triangular sails are the most common, especially because they require fewer points of attachment. Nevertheless, their covering surface is more limited than that of square sails: the tip of a triangle offers less shade than a solid surface. If this last point is important for you, you will be more interested in turning instead to rectangular or square canvas formats. For a more aesthetic appearance, you can also superimpose several shading sails, triangular or not, of different shades. What are the materials of the shade sails? 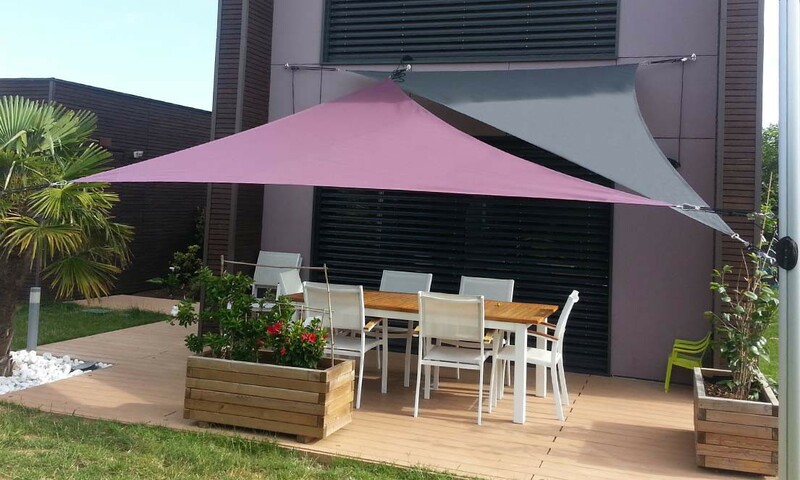 The main difference between the fabrics of the shade sails is their impermeability. A non-water-permeable fabric is made of finer mesh, which has often been water-repellent. The inclination of the shade sail will be all the more important to prevent the formation of water pockets. Our Acryl 300 range is made of waterproof acrylic. The color treatment, acrylic, allows it to better withstand UV rays and rain. Permeable fabrics, with wider mesh, also let in more air, which can be pleasant in the hottest regions. These shade sails can be installed lower than the waterproof fabrics, without fearing a greenhouse effect. Our permeable fabrics are polyethylene and rot-proof. How to choose the color of your shade sail? Different notions must be taken into account before choosing the color of your shade sail. A light color will be more appreciated in a region not very sunny. A dark color will diminish the glare sensation that can be caused by the sun. Neutral shades will be in harmony with old houses. Sustained colors will create a more contemporary atmosphere. Soft tones will contribute to a feeling of pampering. Bright colors will bring dynamism to your outdoors. If it is possible to marry several shade shades between them, it is generally recommended to associate a bright shade with others more neutral. This makes it possible to avoid an unfortunate kaleidoscopic effect. You can also associate the color of your canvases with those of your shutters, for a feeling of welcome unity. The sail shade Acryl 300 comprises for example more than 25 colors to allow you many choices! How to make sure the shade sail will withstand the wind? Its weight: the more important it will be, the thicker the canvas will be. Its edges: if they are reinforced, especially by a reinforcement strap in a hem, they will be stronger. The absence of eyelets: fastener rings are less likely to tear. Despite these options, present on all our canvases, we advise you to detach and store your shade sails if the weather forecasts strong winds, in order to limit the risks. To read also: What height for a shade sail?